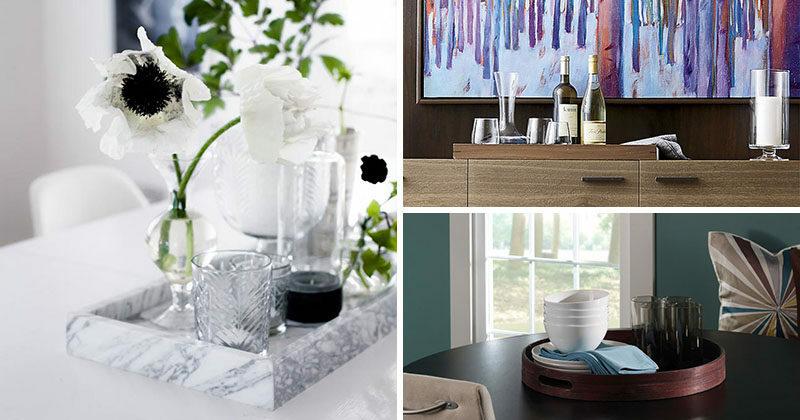 Serving trays are incredibly versatile home decor elements that can be styled in an even wider range of ways. Although they’re called serving trays their functions go way beyond just serving. They help keep you organized, create catch-all spots for similar items, and can tie a room together with a few well placed accents on top of them. 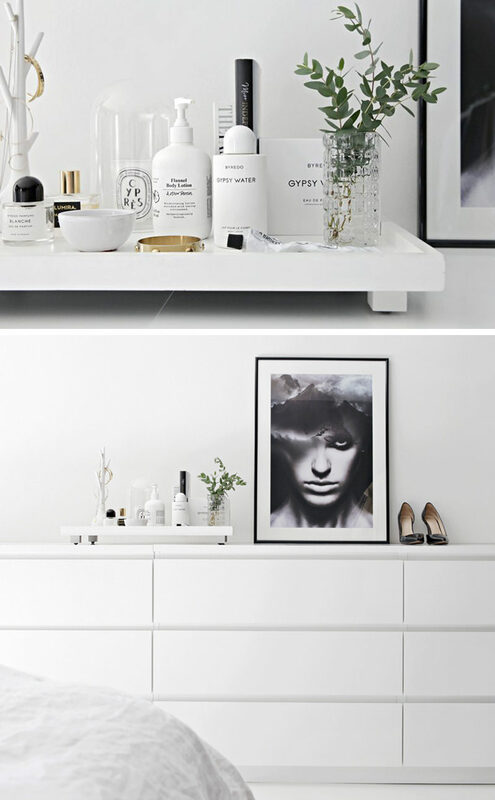 Here are 6 ways you can include a serving tray in your home decor. 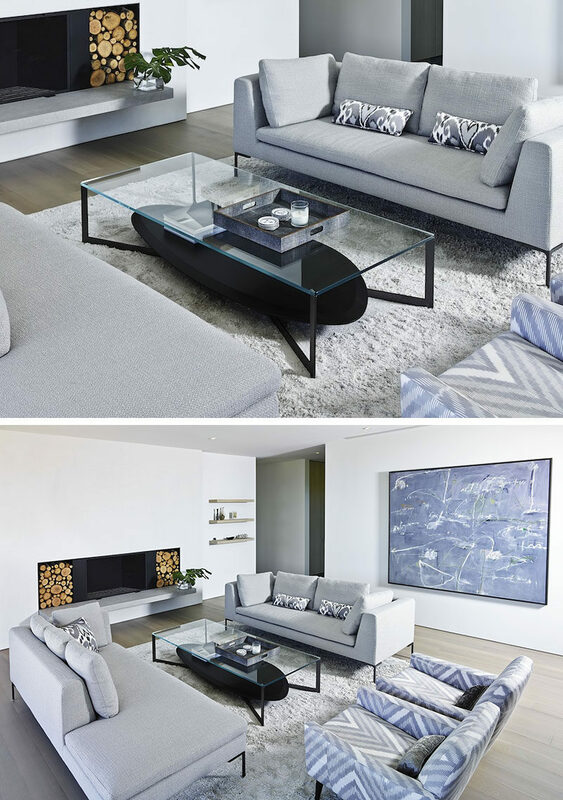 A coffee table tray is a great way to keep all your things in one place and can be styled in a number of different ways depending on the look you’re going for. Here are a few examples. The tray on this coffee table only holds a candle and a few coasters to protect the glass but it makes the table look more put together than if the few items had been strewn randomly across the table. See more photos of this home, here. Designed by Stelle Lomont Rouhani Architects. Interior design by Eleanor Donnelly. Photography by Matthew Carbone. This tray holds candles, flowers, and a few coasters to add both functionality and decor to the living room. 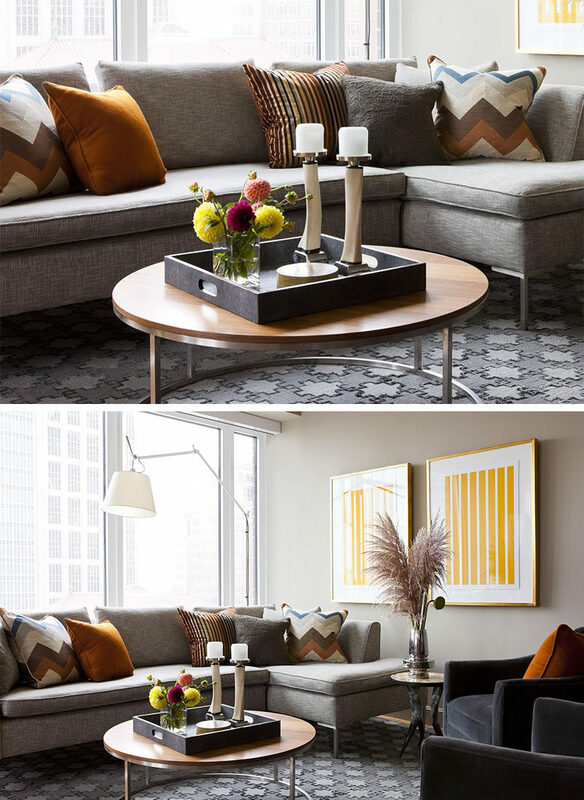 Inspiration from Terrat Elms Interior Design. The round tray on this square ottoman makes the display more dynamic and the various heights of the objects on it make it look intentional and stylish. 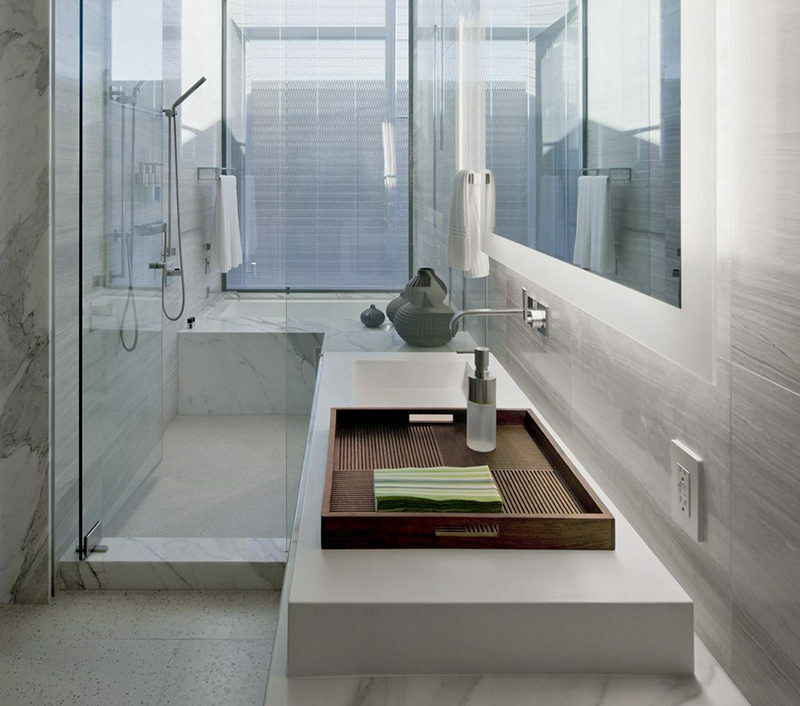 Inspiration from William Reue Architecture. Photography by Steve Freihon. 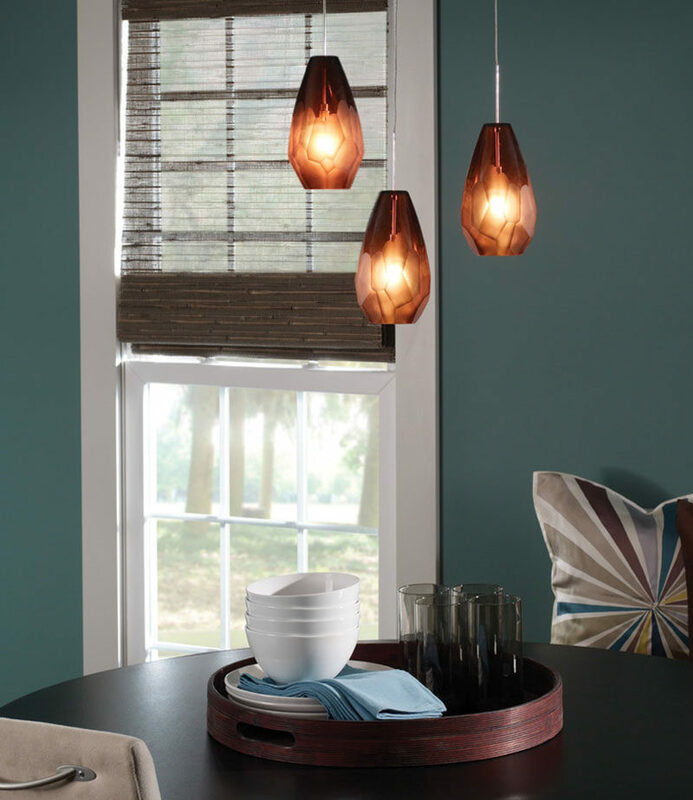 Using a tray on your dining room table is a convenient way to both style the table and keep things close at hand. Candles, flowers, salt and pepper shakers, and other decorative items help add elements of style to the table and make it easy to move everything when it comes time to clean up. 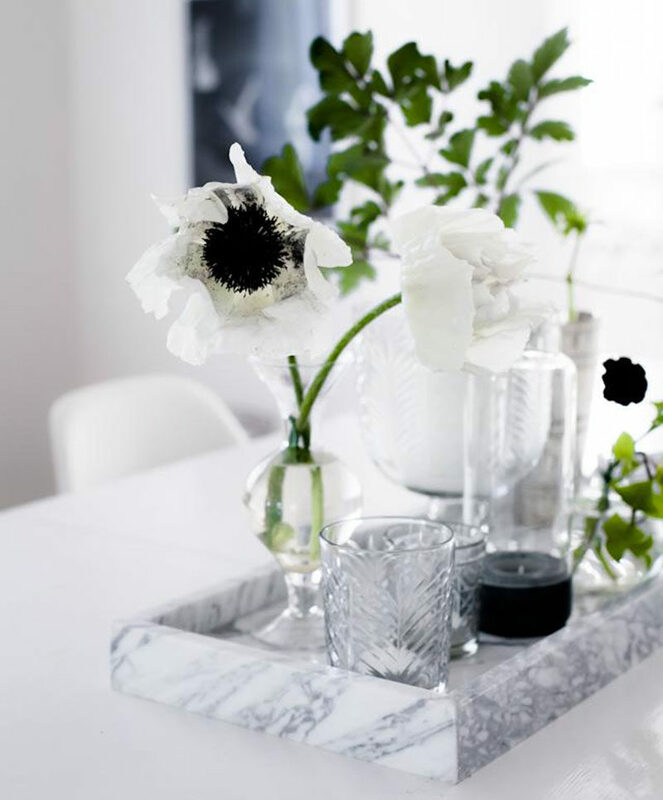 The marble tray on this dining table holds candles and flowers that work with the rest of the decor to make for an organized table that can easily be cleared away. Inspiration and photography from House of Philia. The circular tray on this dining table holds plates, napkins, and glasses to make it easy to transport things between the kitchen and eating areas. Certain bar objects like martini shakers, decanters, and even some bottles have a classic beauty to them. Rather than shut away that beauty in a cupboard or cabinet, put your bar tools and bottles on display in a serving tray. 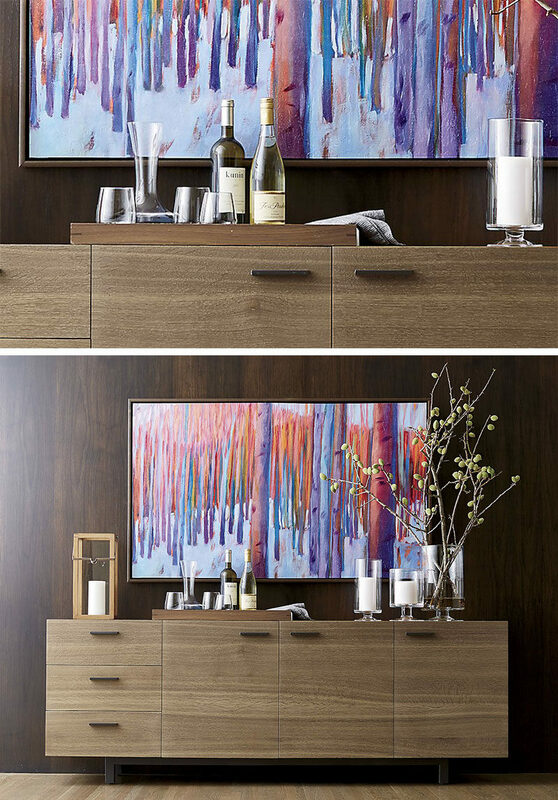 It’ll make your space seem more sophisticated and is an easy way to create a stylish vignette. 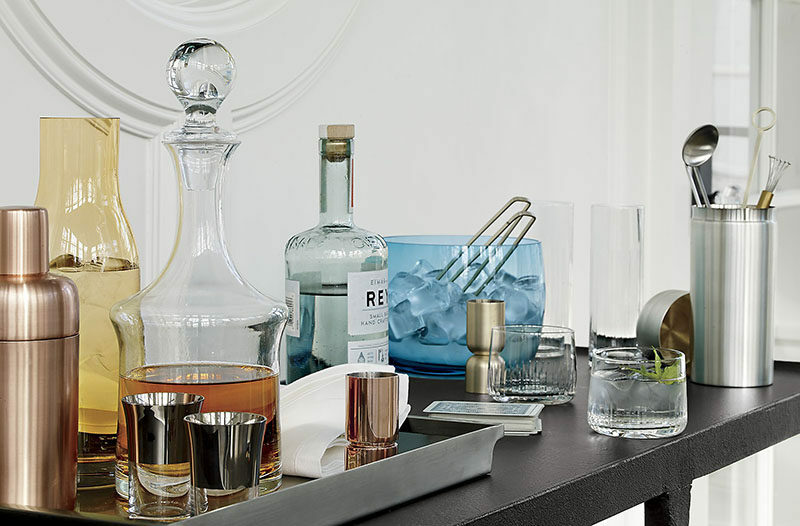 This silver tray holds a copper martini shaker, a tall decanter, a few shot glasses, and a water pitcher to keep everything in one spot and on display. A wood tray makes it easy to transport glassware, a decanter, and wine from the kitchen or wine cellar to wherever the party is. A tray in the kitchen is the perfect way to keep certain items together. The salt and pepper belong with the other frequently used ingredients like oils and garlic so why not keep them all together in one convenient spot? It’s also a great place to keep pots of herbs so they’re always on hand. 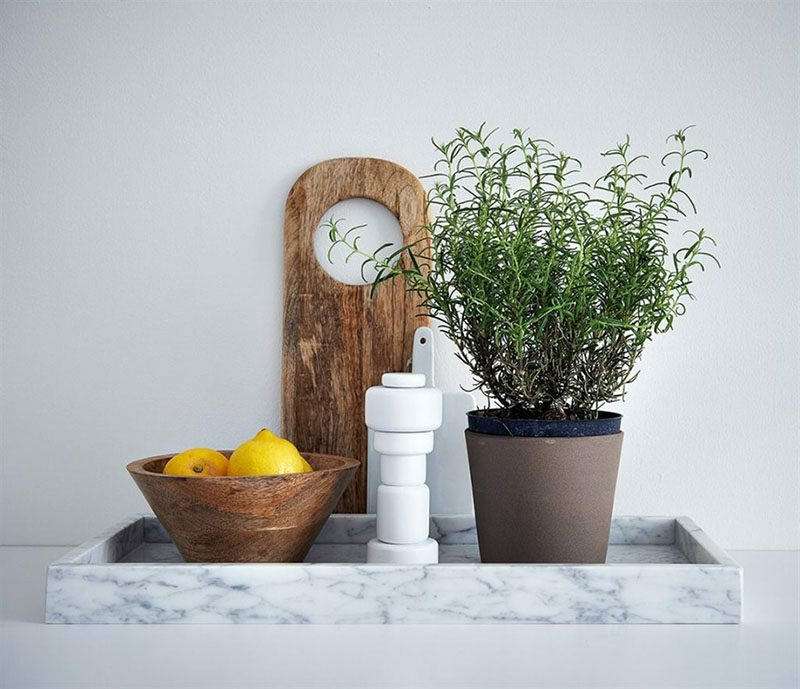 This marble tray holds lemons, a cutting board, and a bush or herbs to make it easy to add flavor to the food while cooking. Inspiration from Blackbird and Alvhem. 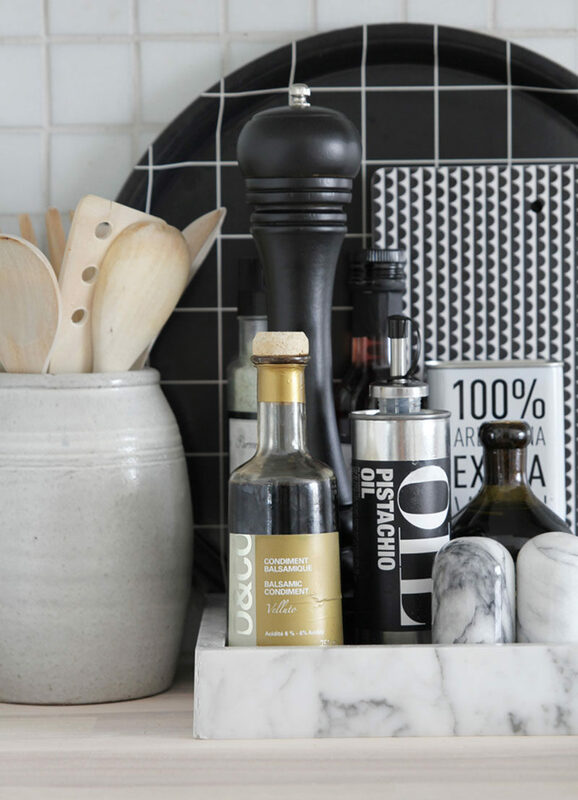 All of the kitchen essentials like oil, vinegar and salt’n’pepper are stored on this tray. Inspiration, photography and styling from Stylizimo. A decorative tray in the bedroom holds anything and everything. Lights, flowers, candles, perfumes, photos, and jewelry are just some of the things you can put on your tray to both keep things organized and looking good. A simple white tray on this bedroom dresser holds a lamp, a delicate stem, and a few beauty essentials. Inspiration from Entrance. Photography by Anders Bergstedt. 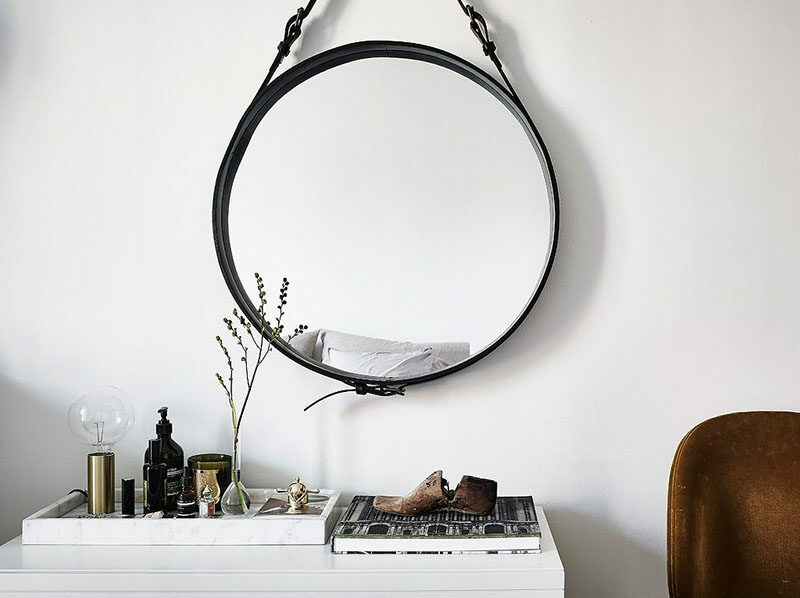 The all white bedroom is complimented by the white tray holding all sorts of small objects, the majority of which are also white. 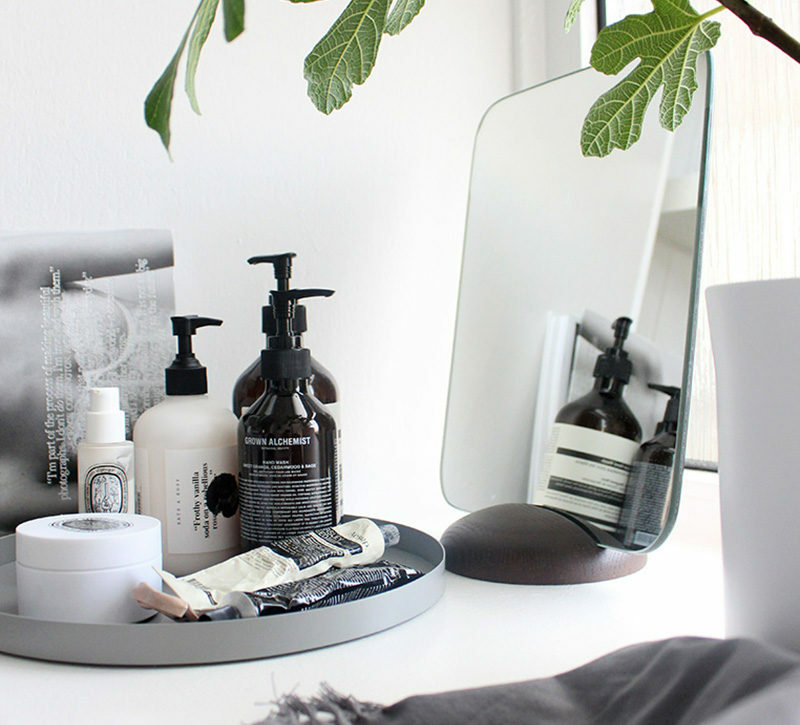 Having a tray in the bathroom is a great way to keep all your cleansers, moisturizers, soaps, and other essentials organized and in a single spot. It prevents things from creating clutter on your counters and makes it easy to reach for exactly what you’re looking for. This circular silver tray sits next to the window and holds various moisturizers and cleaners to minimize clutter and chaos. A tray in the guest bathroom is a great way to leave out fresh towels and soap that your guests can use during their stay. See more photos of this house, here. Designed by assemblageSTUDIO. Photography by Bill Timmerman.